Through the magic of modding, Scourge of War is now the best way to recreate Napoleon-era battles in multi-player. 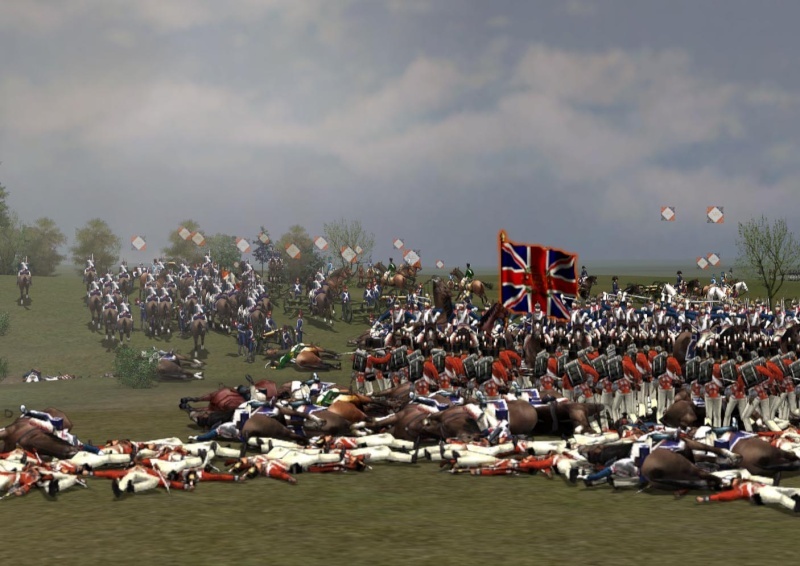 To introduce more players to Gunship24’s wonderful Napoleonic mod, “Road to Wagram/Peninsular” a special Waterloo MP game will be hosted in the usual HITS/GCM Saturday time slot. 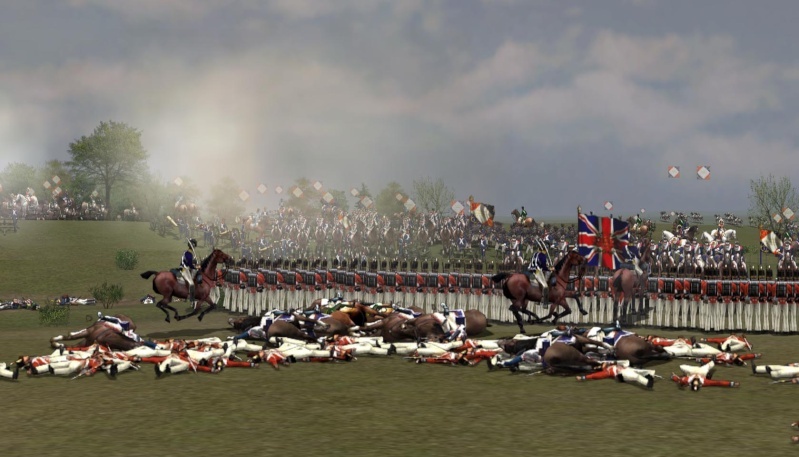 (There are now semi-regular Napoleonic HITS games on Sundays and occasionally other days. See the Kriegspiel Forums for more info). 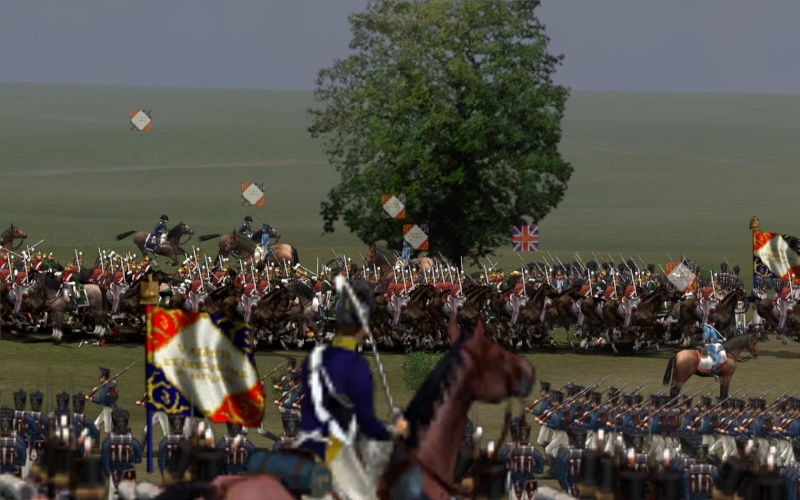 To make this all happen, we will take advantage of Leffe7’s terrific new “Scenario Generator” to actually create the game, and Garnier’s specially created Napoleonic Large Random Maps that more closely recreate early 19th century European battlefields. But there’s no need to run the GCM Launcher or join the Battle Queue for this one! 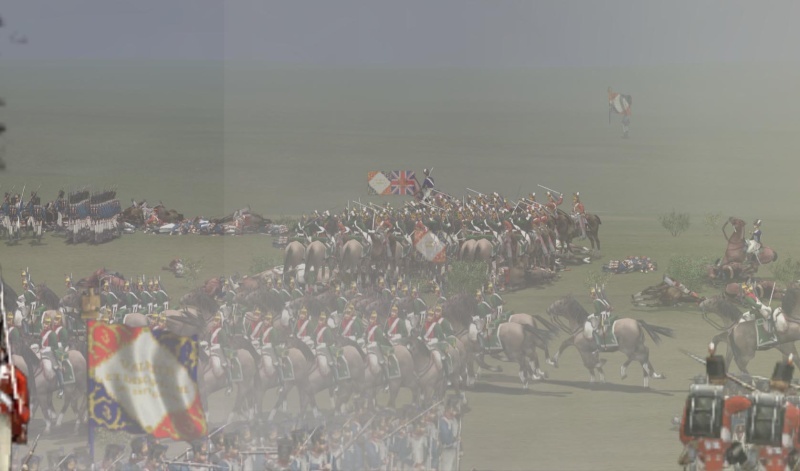 There are many unique aspects of play involved with the Napoleonic mod. You will experience, for instance, cavalry charges, infantry squares, larger & more experienced regiments, and 120 yard rifle ranges. The style of play is also different. As Marching Thru Georgia notes, “unlike the ACW games, [in Napoleonics] there tends to be a preliminary period before the infantry engages. During that time, artillery bombardments take place, cavalry try to establish their superiority and some of the infantry can go on long marches to attack an enemy flank.” In other words, preliminary action and maneuver is typically prolonged – with less of the dash-in for a quick fight. I'm glad to see you put your excellent picture to use. Hays will be so proud. The "official" Waterloo Command Map in use in Saturday's game is a special period recreation, courtesy of Kevin (MTG). This is the one included for download in my post above. In order for players to "sing from the same hymnal" (read: use the same command map) as their CinC's, it is strongly suggested that each player install this new official version prior to the game. Then, unzip the file into your SoW Mods folder and activate "JustCouriers". Oh, and make sure in your list of mods that JustCouriers resides beneath "RandomMaps6" -- Nothing to it! Thanks to Kevin for taking us one step closer to Napoleonic authenticity! I was so looking forward to this, but am not able to make it now Have a great game everyone. I'm curious to know what Allied units Gunship added - did he do the Dutch-Belgians, Nassauers and Hanoverians, or even some Prussians? BTW, I shall try and make this one. To answer your question, we've certainly seen a wide array of Anglo-Allies grace the fields of Belgium so far, including Brunswickers, Dutch, Belgians and others. It makes for a colorful spectacle, to be sure. Can't say that I've noticed any Prussians though. Perhaps they are still on the scenic tour at Wavre. Great! Yesterday I got my games all registered at Matrix and re-downloaded and patched to 1.6 and downloaded the new Nap mod, and everything else, so barring some calamity like a meteor strike or a woman suddenly appearing out of nowhere and demanding my body I shall be there later today! Yes, I have those, and the period version MTG made specially. a woman suddenly appearing out of nowhere and demanding my body I shall be there later today! For goodness sake, 19 players playing Kriegspiel, from-the-saddle, Napoleonic SOW, which must quite frankly be a world record for something, AND I WASN'T THERE ! Please for the love of God someone write an AAR!!! And make it a good one! How was it you fellows? The Anglo-Allies and French armies met on the fields of Belgium (or, if you prefer, Large Random Map 6-3) with spectacular result. Nearly 52,000 men were involved in the struggle for the objective. The gallant British under the inspired command of the Iron Duke (MTG) had victory in their grasp for moment, but were unable to maintain control of the objective. The Emperor Napoleon (Mitra) was put to a severe test but rose to the challenge and ultimately claimed victory for the glory of France. Many thanks to all 18 participants. In size and scope, this may well have been the most colorful spectacle to grace a Scourge of War battlefield to date. Below is a summary of the battle results and player Order of Battle. 16 players IIRC, at least that's how many stars I saw. Did we lose anybody? It was a tremendous spectacle, but knowing the Anglo-Allied army well, I was pretty sure, seeing that this was the Prince of Orange's corps and included Baron Chasse's Dutch-Belgian division that we probably wouldn't be able to pull this one off. We had General Hill's division as well which included a small brigade of foot guards under Maitland plus a few British regiments but most of the army was made up of dubiously-motivated Dutch, Belgians and Hanoverian militia regiments. I commanded Detmer's brigade of a Dutch Fusilier battalion, a Belgian Chasseur battalion and four Dutch-Belgian Militia battalions. The militia were rated 3 under the SoW system and the regulars a 4. Having played many many games of ACW SoW with troops of worse quality than this I felt we might have a chance but during the post-battle debrief I found out that the French were 6s and 7s I was shocked! I was the very tail-end brigade on the line of march as the army moved off in a north-easterly direction from just west of Badenhausen towards Austingen with our cavalry brigades under Gen Hays moving on Rohr to spy out the enemy. I had a lot of fun just remembering how satisfying it is in this game to get a brigade marching along a road for a half-hour or more. 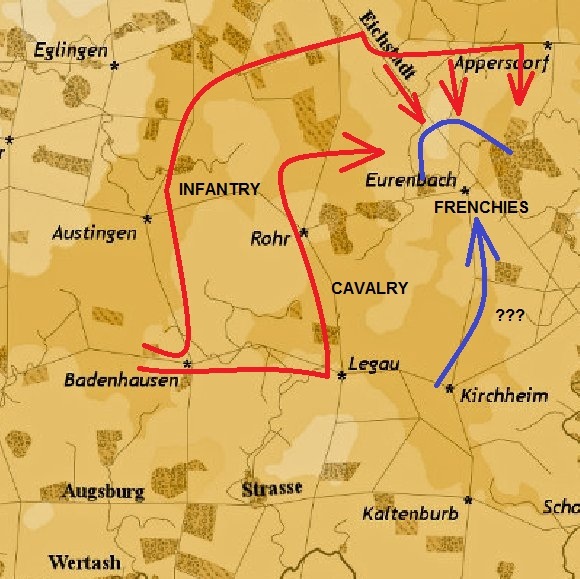 I eventually sighted a French brigade deployed facing north astride the Eichstadt Road somewhere north of Eurenbach and our army ahead of me seemed to be frustratingly intent on marching all around it in a wide clockwise semi-circle. I deployed to observe and threaten the left flank of the enemy and for the longest time they seemed unsupported. I sent off several riders to Gen Baron Chasse (Swinder) advising him that the enemy held the objective though only weakly but our slow amd measured plan ran on, like unstoppable clockwork. I received the order to move from my position threatening the enemy left, right across behind the army to just west of Appersdorf where I deployed as the reserve behind the rest of the division. By now the French on that dam*ed "sausage hill" had been reinforced by guns and more brigades and it looked like we'd have to push them off it the hard way. I was deployed on the left wing with 2 of Kg-Soldier's brigades to my right and his third brigade (3 British regiments under Whiteflag) on my left. We had to advance up a gentle slope and into a wood. We gained ground although my troops were very twitchy and needed constant rotating out of the line but we actually pushed the French back a couple of hundred yards and began to swing around and threaten their right only to see them draw up on the southern fringe of the woods on the high south bank of a small stream which my brigade would have to ford across and then attack up the far bank. All my units in the firing line had suffered many more casualties than they had inflicted and the Netherlands Militia were very poor troops. They would stand and take it in the line for a while but they could not win a battle. It was at this time that I learned (mostly from seeing the horizon behind my right shoulder crowded with fleeing fugitives) that our centre had collapsed and we had to halt our advance and draw back north, trying to cover what was left of our centre. The Nap Mod definitely gives a fantastically colourful game. More please! I think 16 is the max stars, even though more are in the game. There were 18 players to begin. Azisky left the game with a few minutes remaining. I'm not aware that anyone else dropped along the way, but it is possible. I believe SoW shows a maximum of 16 stars, even if more players are in-game. A great deal was learned in this, as in past Nap mod games that should make for even more creative, competitive scenarios in the future. IMO Stefan's Scenario Generator represents a real breakthrough in SoW MP play. Thanks for the updates - and for the AAR Diggers - good to have you back! I'm really looking forward to the next of these! The morning sky hinted at rain. A more apropos foreshadowing would have been a sign of deluge. I suffered no illusions. The day would be grim and chances of victory were slim and the chance of survival not much better. Rumor had it Napoleon himself would lead the defense of Sausage Hill: the runt defending the little weenie. From south of Austingen, we moved north by road all the way to Hohenwart and then further east down Ulm Strasse, finally moving south and forming up northeast of Sausage Hill. I had hoped to have my division on the left, Will in the center, and Swinder on the right. But we didn’t have time to worry about keeping with the plan. French infantry and guns were adjusting positions. Soon the French artillery would serve pain for lunch. Swinder wasn’t up yet and I wasn’t sure where Will was. So I sent a courier to Swinder and told him I was going to assault the hill from the northeast and that hopefully I could weaken them enough so that he could follow me and clean up. I sent Will a courier asking him to screen Swinder’s right and follow him to glory if the opportunity arose. I had three brigades of good troops. Two under my direct command, Prince Bernhard and von Butler; Whiteflag commanded the third, Sir John Lambert: all together some 10,000 able-bodied soldiers. I formed Prince Bernhard’s brigade into double line and marched them up the slope and sent my best troops to the orchard on my left. I ordered Whiteflag to move to the orchard as well and screen my left flank when I started the assault. I hoped moving two brigades to the left would cause the French to shift troops to their flank. They complied, leaving Leffe’s brigade on the hill with a small brigade of Weathers’. So far the brunt of the French artillery fire had been directed at Swinder, I guess, because I hadn’t suffered many casualties. With that in mind, my morale was high. I was going to run Leffe off that hill and do my best to kill Napoleon, sitting on his horse right on the crest. I gave the order to von Butler to form assault columns and use the creek which separated the orchard from a rather large wood on my left as a screen for his four level five experience regiments as they followed one after the other up the hill and into Leffe’s brigade’s right flank. At the same time, I let loose Prince Bernhard’s six level four regiments from their position directly in front of Leffe’. Glory followed. Drunk with battle’s rage, my men put the French to the bayonet and broke regiment after regiment. “To the guns” I shouted and brave lads ate canister but pushed on, capturing several guns but taking too many casualties. Weather began moving fresh regiments across the creek to attack my left. I screened them as best I could and tried to reform and rally my troops. I was up over 600 points. That wouldn’t last. I hoped that Swinder would have the strength to finish what I’d started but his division had taken massive casualties from artillery and I think even some French cavalry and I wasn’t sure where Will even was at this point. The left was pretty solid. Whiteflag had done well protecting my left and Digby showed up to take up the task just as Whiteflag’s men began to falter. I called on the boys for one last go. We drove to the crest of the hill and turned the objective in our favor for a few minutes. Great fun. I’m up for this every Saturday and even Sunday. Outstanding AAR. Wow, I didn't realize Jack London fought at Waterloo. Thanks for the heads-up on the 16 star limit, I didn't know that. Nice AAR Soldier and thanks to Palmer for a brilliantly-organised game. kg little mac wrote: Great fun. I’m up for this every Saturday and even Sunday. Thanks for the AAR Mark - and I agree with the sentiment - every weekend please! The fight on the British right and center were desperate affairs involving the cavalry. It was a very dangerous environment for an infantryman. On the right the dragoons of each side fought for battlefield dominance. 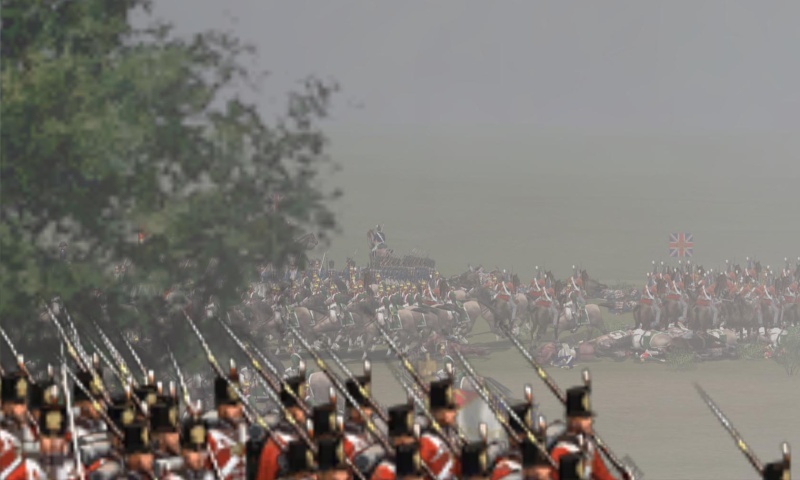 French Dragoons try to stop their British counterparts. In the center several squadrons of cuirassiers kept watch. One squadron is repulsed and another charges in. Wow, great screen shots. Tends to make one look behind to see if you're about to get a lance in the backside! The only thing I will add is that once the head of the column reached Hohenwart, the Prince of Orange, Soldier, wanted to march down the Eichstadt Road and up onto Sausage Hill. The Iron Duke was convinced that the short man in blue must be sitting there with most of his forces. He would never leave it undefended. So the column continued east. He also received a report from his cavalry commander stating that there were a number of frogs on the high ground south of the Eurenbach Road. In light of this and Digby's AAR, the Duke should have taken the advice of the Orangeman. This was one of the better fights I have participated in. The asymetric nature of the two armies made it a very interesting problem to solve for Mitra and me. Hopefully Ron will keep them coming.